Our Savvy Sleeper Sofas offer the most custom options available for sleeper sofas; with over 40 styles, 600 upholstery options, six sizes, and four mattresses. Most Savvy Sleepers include 2 accent pillows, which can be made to match or contrast with your sofa, and many styles even offer contrasting piping. Our Savvy products cost roughly half as much as comparable options, but offer twice the selection. All of our sleepers feature kiln-dried hardwood frames, which include a lifetime warranty, and are made in the U.S.. Selecting your style and size are the first two steps to finding your perfect sleeper. 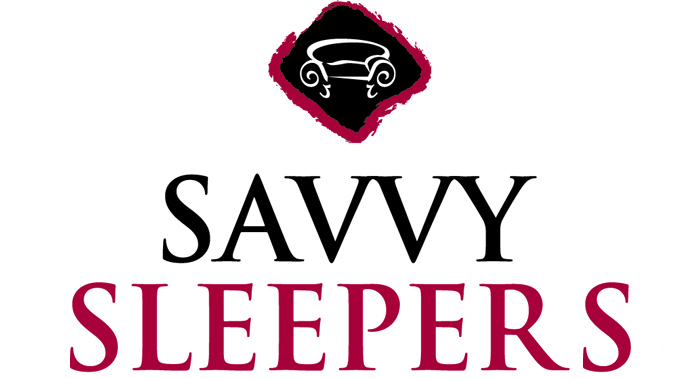 By going to our Savvy Sleeper Selection Page, you can view all available Savvy sofa beds, and even filter the selection further by selecting your size from the available links towards the top of the page. Our sleepers are available in 6 sizes: Chair, Twin, Full, Queen, Chaise Sectional, and True Sectional. Now for the FUN part! After you have narrowed down the options, you will be directed towards a product page which offers a "Customize and Purchase" button. Click on this button! (Please note: absolutely no purchase or personal information is necessary to access this feature.) The Customize and Purchase button will take you to our Sleeper Design Center, where you can customize the sleeper of your choice to fulfill all your needs and desires. 'Step 1' is to find the perfect upholstery, while 'Additional Options' includes mattress selection, and even custom sheets and foot color selection, if so desired. All our Savvy Sleepers include the new 6-and-a-half inch Dreamsleeper mattress at no additional cost. The Dreamsleeper is a significant upgrade from what is generally offered with a sofa bed. These sleepers do contain an upgraded mechanism--with the bar moved two feet away from your back, and a built-in headrest for reading or watching TV. 6.5" Dreamsleeper (Included): A 2" thicker mattress than standard sleeper beds, the Dreamsleeper is a step up from what is generally offered. Air-Coil Dreamsleeper ($300 upgrade): Our most innovative mattress option, the Air-Coil provides the width profile of a regular bedroom mattress-- with a 6" inflatable air bladder atop a Dreamsleeper spring base. You will never feel even a hint of a bar when you choose this mattress option. Enso Gel-Infused Memory Foam ($350 upgrade): The newest addition to our sleeper mattress family--the Enso Memory Foam has quickly become a customer favorite. Reactive to any guest's size, shape, and heat--the Enso provides a tailored, most luxurious night's rest. Temperature controlled, this bed will work wonders regardless of the climate.